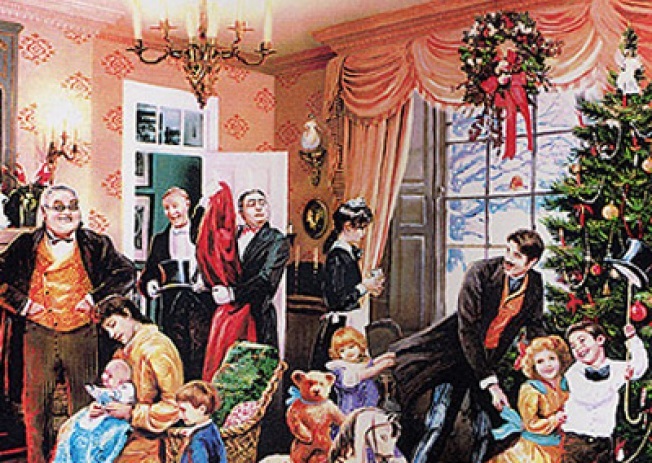 Get a taste of old (old) New York at the Merchant's House Museum's 19th Century Holiday Party. Think you've got a lock on old-school New York? We're not talking Studio 54 old-school, people. We're talking a good century before that, when women donned high-ruffled collars and men waxed the tippy-tips of their handlebar moustaches, and then everyone went out for bishop. Do you know what bishop is? If you answered something about chess or Jesus, you're wrong. It's mulled port wine with roasted oranges. Step back in time at Wednesday's 19th Century Holiday Party at the Merchant's House Museum, where there will be bishop aplenty in the gorgeously appointed parlors, along with all sorts of other throwbacky delicacies, like figgy pudding (of "Oh bring us some figgy pudding" fame). Expect everything to be wildly authentic, from Victorian Christmas tree ornaments to illumination by candle and gaselier (that's a gas chandelier, of course). The whole shebang wraps with caroling, a gift bazaar, and a silent auction. C'mon, how often do you get to wear your monocle? 6:30PM; Merchant's House Museum; 29 E. 4th St. at the Bowery, (212) 777-1089.